Android has already become the most dominant type of mobile device on the planet, and now the Google-owned operating system is owner of the mobile Web’s most used browser, according to data from StatCounter, via Phandroid. Figures from the online measurement service show that February saw use of Android’s ‘robot’ browser overtake Opera to take the top spot for the first time. The chart (click to enlarge), which plots the use of mobile Internet browsers over the last twelve months, shows significant growth from Android, which had only just overtaken BlackBerry to fourth place one year ago. Opera, which is particularly popular in Africa and Asia, sits in second and the firm will look to increase its share with the newly released developer beta version of its popular Opera Mini Browser, aimed at giving users a more advanced and social mobile Web experience. The Scandinavian firm does not own its own devices but, thanks to deals with firms like Samsung — which pre-loads Opera onto its feature phones — the browser is well used. 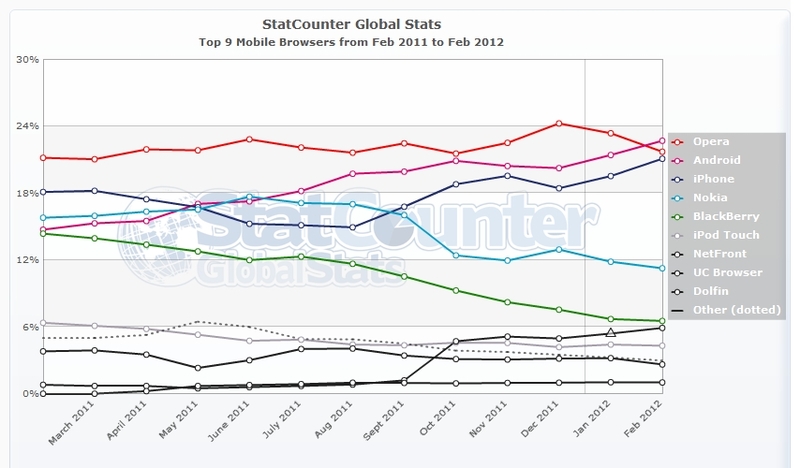 StatCounter breaks out usage of the iPhone and iPod Touch, which might otherwise see Apple’s browser rank first. However, considering the numerical advantage that Android has over Apple — there are now more than 300 million Android devices worldwide, that’s up 250 percent — the fact that the iPhone ranks so closely shows that its users are proportionally more likely to browse the Web than Android owners. However, as Google looks to push the mobile version of its Chrome browser to its devices, will it be able to increase the Internet usage of Android owners going forward? Other interesting trends see BlackBerry’s share of Web browsing continue to plummet, while Nokia has also seen its browser account for less Web browsing over the period. It should be said that measurement is often an imprecise science, especially when it comes to the Internet and mobile. However, the gist of the data serves to illustrate that Android is growing massively and, if not now, it is soon likely to be the mobile Web’s most used browser. Last month, StatCounter assessed which mobile device manufacturer had the most mobile Internet-enabled devices in use worldwide (based on volume of phones rather than their usage). Nokia topped that ranking but the firm clearly struggles to convert Internet owners into regular mobile browsers, as its Web browsing traffic is particularly low.